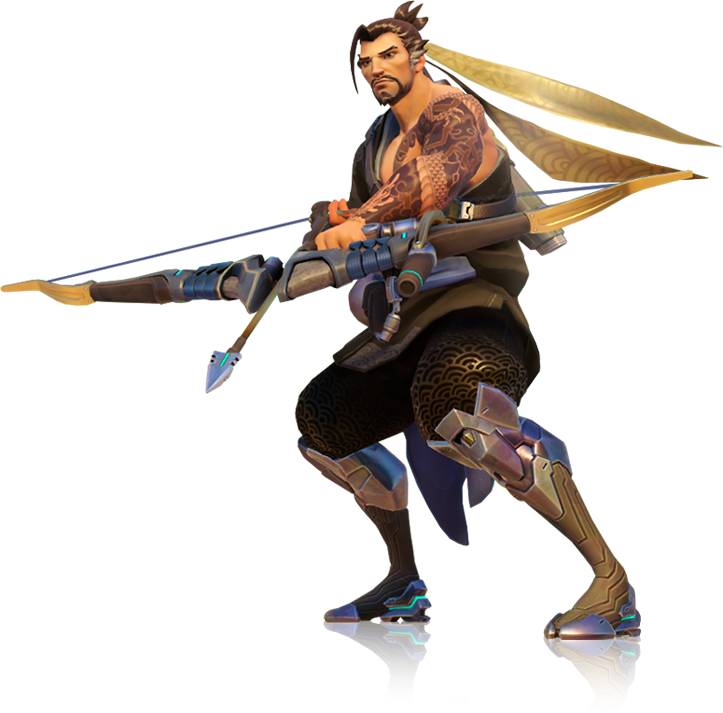 Hanzo is an incredibly popular Hero that’s capable of not only providing vision to his team, but also scattering arrows for area of effect pressure. In a similar vein to Widowmaker, he’s an effective sniper, but one that’s stronger at slightly shorter distance. His ability to wall-climb and potentially wipe the opposing team with a well placed Ultimate makes him particularly effective when defending, though still viable on offence in some circumstances. I will add that many consider Hanzo poor compared to Widowmaker, simply because of his arm time when he draws an arrow and the falloff from a distance. His Ultimate can also be easily avoided by skilled players. Despite that, in the right hands he is formidable and can be particularly difficult to fight against. If you are new, start from the top of the guide and work your way through. If you are an experienced player then jump right down to the Tips and Tricks for more advanced help. Having the ability to wall climb is invaluable for engaging and escaping Can't hold a point or a payload well. Upon the death of his father, the clan elders instructed Hanzo to straighten out his wayward younger brother, Genji, so that he, too, might help rule the Shimada empire. When his brother refused, Hanzo was forced to kill him. Unbeknownst to Hanzo, however, Genji narrowly survived the attempt with the help of Overwatch. This act broke Hanzo's heart and drove him to reject his father's legacy, ultimately leading him to abandon the clan and all that he had worked so hard to attain. That was ten years ago. Now, Hanzo travels the world, perfecting his skills as a warrior, attempting to restore his honor and put the ghosts of his past to rest, honing his murderous skills all the while. Wall Climb (Passive) - Allowing Hanzo to scale any wall, his passive grants him access to a variety of locations other Heroes can’t reach. This is particularly useful when defending, in order to reach upper ledges, but can also be used defensively to evade those chasing you. The only other Hero able to climb in this way is Genji and although Widowmaker can use her Grappling Hook, she has a cooldown. It’s also possible to make some smart plays with Wall Climb as if you jump up a wall, you can then climb it before leaping onto a ledge that might have previously been out of reach. Storm Bow - Hanzo’s primary means of attack doesn’t have an alternative fire. He relies solely on the drawing and loosing of arrows. It takes a little under a second for Hanzo to nock an arrow and fire it, with it dealing more damage based on its full draw. If you simply click the left mouse button and instantly release one, its range is very short and its damage low (28). In contrast, if you do fully draw an arrow it hits for 125 damage. Depending on the strength of your draw doesn’t make any difference to your ability to land headshots: both can. Just be aware that there’s a narrow arc to your arrows as they fly, meaning you’ll have to compensate for the dip at further distances. Tip - If your bow is fully drawn, you can drop your shot by pressing the right mouse button. Sonic Arrow - Allowing Hanzo to fire an arrow with a tracking device, the Sonic Arrow will reveal all enemies near it for several seconds. It provides invaluable vision for you and your team and allows you to lead shots as players come into view, especially when defending (they’ll come to you). Just be aware that Sonic Arrow has a 20 second cooldown so be sure to place it in key locations where you need vision. Tip - The arc on Sonic Arrow is much greater than Hanzo’s others. Use this to fire it further when needed. Scatter Arrow - Allowing Hanzo to fire an arrow that fragments and ricochets off surfaces and objects. Used in a confined space, fired into a room or corridor it can cause serious damage although the random nature of it doesn’t always lead to the deaths of specific Heroes. Scatter Arrow often secures kills when you least expect it and is also particularly effective when fired at the floor if an enemy Hero is next to you: all arrows usually hit them (that is 450 damage). It seems to scatter in a pentagonal shape with an arrow in the middle. This shape would be distorted based on angle of impact. Dragonstrike (Ultimate) - After a short cast time Hanzo will fire a unique arrow that creates a spiralling pair of dragons. Capable of only flying forwards, the dragons will deal huge damage to anyone caught near their center and will deal continued damage as long as they remain it. Anyone who comes into contact with the dragons will also take damage. Although Dragonstike is capable of securing multiple kills, the fact it’s slow moving makes it particularly good for area denial. If you’re seeking kills, it’s best used at close range when enemies can’t see you cast it - they’ll then be unable to tell which direction it’s coming from. Tip - It’s often best to use Dragonstrike against enemies that can’t move. It pairs amazingly well with Zarya’s Graviton Surge or Reinhardt’s Earthshatter. Hanzo is defined as a defensive Hero because most of his skills suit that playstyle. His strong area denial, quiet arrows and vision allow him to see enemy movement and react to it when defending. The fact he can also climb walls allows him to hide in hard to reach locations where enemies won’t know where he’s firing from. It’s in your interests to maximize the use of Wall Climbing so that you’re constantly using side routes around the map to arrive in locations where the enemy doesn’t expect you. It’s also imperative that you regularly maintain vision on the enemy, whether playing offensively or defensively. Not only does this allow you to draw shots in preparation for meeting them, but also allows your team to adjust their routes or to hang back if there’s a bottleneck of players ahead. Tip - Wall Climbing is an incredibly strong Passive - make sure you maximize its potential by always gaining vantage over Heroes incapable of following you. As for dealing damage and maximizing your bow potential, I will admit that it takes some getting used to. Not only do you need to factor in the draw time, but you also have to take account of the arc when they’re in flight. This makes Hanzo much more suited to medium ranges than acting as a sniper. The nature of Hanzo’s Storm Bow also ensures that if he’s trying to go toe to toe against long range Heroes who can fire quickly and accurately (Widowmaker/Zenyatta/Mei) he’ll often lose. Despite that, he’s still a ranged threat players should be wary of. If you can, try to pre-arm your bow and then walk into the vision of the enemy for a quick release. Alternatively, use cover while firing quick arrows - just remember that your damage and range will be reduced until fully drawn. Finally, Dragonstike shouldn’t be used hastily. It’s a slow moving Ultimate that has a key vocal announcement. When players hear this, they’ll quickly look for its location,so it’s incredibly important that players don’t see you fire it. Try to get vision on the enemy team, hide and then release it. That way they’ll struggle to pinpoint where it’s actually coming from. If you can, always use it when you can pair it with an allied Ultimate ability so that you can gaurentee it impacts those in its path. Remember, you can fire it through walls, or just about anything. Heroes listed here are particularly challenging for Hanzo. While those listed can still be killed, they pose a particularly difficult challenge for him so be sure to take extra care. Reaper:His ability to teleport to you can prove incredibly difficult to deal with. He'll often appear out of nowhere and once he's close to you, there's almost nothing you can do to prevent yourself being killed. Pharah: Her range is incredible and if she has vision on you, she'll bombard you from above. Although she's slow moving in the air, the arc and flight of your arrows makes her difficult to pin down. This list of tips and tricks are just a handful of things we think will help your Hanzo play. We'll continue to add to the list as required and if you have any tips you'd like to share, let us know in the comments below and we'll place them here. How to get Pre-match info on Heroes the opponents have picked. 1. Remember that your primary attack deals more damage the longer you hold it. 2. Hanzo is far more effective on defence as his Sonic Arrow combined with his draw time allows him to lead targets as they run into his sightline. 3. Your Sonic Arrow doesn't last long. Be sure to use it when you suspect players are incoming, or if your team is advancing. 4. Scatter Arrow is fairly poor in open spaces. It's far stronger when used in corridors or small rooms. If you can, it's also worth aiming near a Hero (from a wall or the floor) so the arrows fly towards them when they shatter. 5. Your Ultimate ability deals huge damage but it moves slowly and only moves in a straight line. Fire it when enemies don't expect or to zone them out (it'll clear anyone escorting a Payload). 6. Hanzo isn't great 1 on 1. His arrows take time to draw, he can't draw them quickly and he has almost no means of defending himself (outside of using a Scatter Arrow at his feet). Try to keep vision on your flanks. 7. Always try to find high ground through using your Passive. This gives you an advantage over those below but also builds on your arrows and their arc. 8. Hanzo can be particularly good at killing Torbjorn and his turret as well as Bastion. Stay at maximum range and fire at them as quickly as possible - they'll be unable to do anything about it. 9. Dragonstrike is best used when the enemy can't see you. Although they'll know you've used your Ultimate, having the element of surprise as to where it will come from is key. 10. If you do end up fighting someone close range, stay calm and charge up a shot, 125 damage will likely out damage the enemy. Make sure to land the shot. 11. Try to always aim for the body unless your aim is exceptional. 125 damage for a fully charged arrow will bring most Heroes close to death. 12. Playing a flanking style (abuse your wall climb ability) allows you to maximize the damage of your ultimate. 13. Firing your Scatter Arrow at an opponent's feet will cause all three arrows to strike their target.